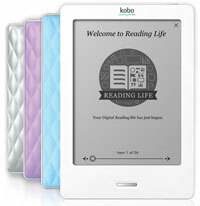 90% off Codes for Kobo eBooks, $79 Kobo Touch; A New Kobo Device About to Launch? Kobo is offering some huge sales right now, so big it makes you wonder if something is about to go down. Giving out codes for 90% off of ebooks is a good way to rack up sales and draw in customers, but certainly isn’t a good way to make money. It makes me think Kobo is about to do something big. About this time last year they were giving out a ton of discount codes right before they launched the Kobo Touch ereader. After that the discount codes dried up for a while. Is a new Kobo eReader or Tablet on the verge of being released? I’d say there is a very good chance that Kobo is about to release a new gadget. They release a new E Ink ereader about this time every year, but unless they are adding a light to it like the new Nook Glow, it’s hard to imagine what kind of major changes they could make. Color E Ink just doesn’t seem like it has much of a chance until the technology is improved. It’s more likely that Kobo could introduce a successor to the Kobo Vox, seeing as how it is pretty out-dated by tablet standards, even though it is less than a year old. These discount codes for Kobobooks.com are one use per customer and the usual publishing house segregation rules apply, meaning titles from certain publishers can’t be discounted (it will be interesting to see how the DOJ price-fixing lawsuit affects this moving forward). The above codes could all expire at any time. Codes via MobileRead and my inbox. The Kobo Touch is on sale until May 3rd when ordering from Kobo directly. The best deal is the Mother’s Day bundle that includes a Kobo Touch and a gel skin case for $99. It is the regular Kobo Touch without ads that normally sells for $129, and the gel skins sell for $14.99. The Kobo Touch with Offers (screensaver ads) is marked down to $79, the same as the Kindle 4. Given the fact both have ads and the Kobo Touch has a touchscreen and some extra features, that is an impressive price. But the bundle package is the better deal overall since it comes with a case and has no advertisements. Is it legal to use discount codes that aren’t meant for you? You mean using the US code in Canada and vice versa? The way I look at it is if Kobo didn’t want people using the regional codes outside of their regions then they shouldn’t work when entering them. Kobo has been doing it that way for a long time and are well aware of the threads at MobileRead pointing it out. If it were a problem they would surly just stop using the regional codes altogether and just offer one specific code. I think the different codes are probably more for tracking sales than anything, because using regional codes doesn’t really make any sense when you think about it, when the same code is available and works for everyone. Nathan, you made my night. I ran into problems with two books that I wanted (their US publishers didn’t allow the codes), but since Kobo is an international eBook company, I found their Euro editions! I got a $14.99 eBook for $1.27, and a $12.99 eBook for like .70 cents because the Euro edition was already discounted with a list price around $7. I than proceeded to use the rest of the codes on other books that came out to be between $2-$5. I am elated. Kobo is an excellent company. They are the only ones who discount eBooks like this. I don’t know what new device they are coming out with soon, but I am trading in my Kindle for a Kobo Touch and (hopefully) an upgraded tablet. Thanks again for publishing great deals like this! Your blog rocks. What site did you find the euro editions on? @Stan – I found the Euro editions on the standard Kobo eBooks site. When I searched my author’s name, the first two pages consisted of the more expensive US editions (that wouldn’t accept the discount codes), then the following pages had the duplicate editions released in the UK and Europe. The only difference between them is the dust jacket design. This trick may not work for every author; the books I purchased were quite popular overseas (enough to merit European editions) and the author was born in the UK and used Euro publishers to distribute his work there. I just updated the post to add a few more codes I found at MobileRead for $10 off and $5 off. It looks like they may expire tomorrow, April 22nd, but I’m not positive. Unfortunately, these codes can be used for very few of the books on the Kobo site. Tried about 20 books, all with no luck. And very few have european editions. Which pretty much means that these codes, while nice to see, are basically worthless. I can kinda see why Kobo doesn’t mind if these codes get out- no one can use them and it drives traffic to their site anyhow. It took a while, but I finally found a book I could use a Promo Code on. Nice to get a book that lists for $35, that was on sale for $21, marked down to about $5 with the code. Thanks for the codes, Nathan. So I’m currently in Ukraine, and when I go to the Kobo site I see all sorts of discounts. When I go to buy a book, the discounts are still there even after I apply my promo codes (Double savings for the win!). But once I tell the system my address is in the States, it tells me I can’t use the promo code and takes away the original discount offer. In other words, the US regional code didn’t work in the US, but did in fact work outside the US. And I’m really OK with that. These Kobo coupons are virtually useless. I spent 2 hours looking for any book that would accept them and could not find one! And I wasn’t only looking at new releases–i was willing to buy anything at the end of these 3 hours and not one accepted coupons. What’s the point of sending these discounts if they don’t apply to anything? I am running get out of kobo land as fast as possible. It was an exercise in futility trying to give them my money! Check the date first. This post is over 6 months old so it’s no surprise the codes have expired by now. You can check the referenced thread at MobileRead for updated codes and a list of tips to find ebooks that the codes will work on.